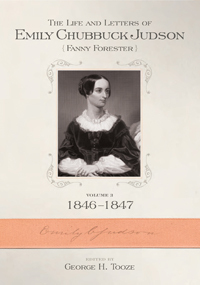 Volume 3 begins with a letter from Emily E. Chubbuck to Anna Maria Anable telling in awestruck tones that her innocent flirtation with Adoniram Judson has blossomed into something much more serious. That was resolved rather quickly when he proposed formally on January 20. Over the next several months the letters reflect her great joy in this wonderful love that both came to believe was ordained by God. They also reflect Emily’s personal angst as she fought with her perceptions of what she had been in her “worldly” period. This darkness especially focused on letters she wanted returned from N. P. Willis that, if made public, would have been, in her judgment, detrimental to the reputation of the great missionary and his “secular” wife. The letters were ultimately returned and destroyed, though interestingly Emily kept the letters that N. P. Willis had sent to her, and they are included in this correspondence. Emily and Adoniram were married on June 2, 1846 and embarked from Boston to Burma (Myanmar) on July 11. The next section contains letters and poetry from the long five-month voyage, landing in Burma at the end of November, and settling into missionary life. The new year of 1847 opens with the desire to go and establish a mission in Rangoon preparatory to mission in the capital city of Ava, the separation from mission friends, the fire that destroyed all of their worldly possessions, the tribulation of a house full of bats (“bat castle” as Emily was to call it), and the rejection of the mission to Ava by the mission board. They return to Moulmain in fall 1847 to continue work on a Burmese dictionary, and to settle into the mission community that was so strong there. Volume 3 closes with the birth of Emily Frances Judson, and the poem “My Bird” which Emily wrote to commemorate that blessed event.